I've said it before and I will say it again....I just don't eat fish as often as I should. I blame it, in part, on the fact that I have lived out my life thus far in the somewhat land locked middle of the country...far from either ocean. Sure, Lake Erie is right to the North of me...but fresh water fish, let alone Lake Erie fresh water fish, doesn't excite me much. There is no great fish monger within any good distance from my home, or at least one I am aware of, and fresh fish in the grocery store? Um...no thanks. ( with the exception of Whole Foods, if there was one closer to me ) So I am forced to choose from the slim varieties of frozen fish available to me...mostly tilapia, salmon, cod or sometimes, haddock. Cod, tilapia and haddock basically all taste very similar. Then there is the skin and bone issue....no thanks on either. Oh , and please, don't taste too fishy...lol... So I guess when it comes to fish, I am kind of picky. Don't get me wrong...I try to experiment with different kinds of fish when I go out to a restaurant or travel to the coast. ( Yet I always worry about the skin and bone issue I have!) But I seem stifled when wanting to prepare fish at home. 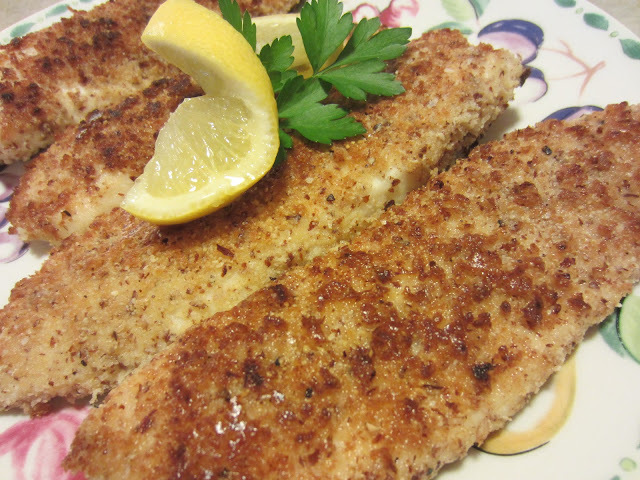 One fish I like to buy and prepare, is the tilapia loin. It can be elusive, no doubt. Fortunately, Costco carries it. I like the loin because it has virtually none of the dark flesh which can tend to taste very fishy. ( Remember, not too fishy?) It is thick and meaty...and I have yet to discover a rouge bone in one. ( I hoped I haven't jinxed myself with that last statement!) The tilapia loin is very mild tasting and not priced too outrageously, but I seem to get stuck in a rut preparing it the same way over and over again. So I browsed the internet looking for inspiration. I don't even remember where I saw the idea of mixing panko bread crumbs and nut meal together to make a crust, so I am sorry, I can't give credit...but the creation I ended up making, really was out of my head and what I had available to me in my pantry and freezer. I could not have been more pleased with the result. So simple, yet so delicious. So easy you can hardly call it a recipe. I used almond meal I had in my freezer, I had picked up from Trader Joe's, but you could easily make your own by grinding up the almonds in a food processor. A word of warning though, the almond meal and panko brown VERY QUICKLY...so use med heat only. Brown the outside on the stovetop, then finish cooking fish in the oven on a wire rack over a sheet pan. 1. Preheat oven to 300 degrees F. Position wire rack ontop of sheet pan. Spray with cooking spray. 2. In a large pie plate or shallow dish, combine the panko, almond meal, salt, pepper and lemon zest if using. In another pie plate or shallow dish, pour in the eggbeaters. 3. Heat a large nonstick skillet with 1 TBS olive oil. When oil is hot enough ( beginning to see wisps form in the oil) dredge a piece of fish in the eggbeaters and then coat in the panko mixture. Place in skillet. Repeat with another piece of fish. Don't overcrowd the pan. ( I did mine in two batches ) Brown fish on each side. Be careful. This won't take long at all. Transfer browned and partially cooked fish to wire rack. Place in oven and repeat with browning remaining fish, using the other TBS of oil and transferring them to wire rack in oven. 4. Allow to finish cooking in oven. Amount of time needed may depend on how long they stay on stove top. Fish is ready when it is firm and flaky. Mine took about 10 minutes or so, but I was using thick loins. Garnish with lemon. This sounds good. I also am NOT a fish person. I have had frozen tilapia (as a matter of fact I have some in my freezer now). It seems to have a plasticy taste to me. I think I'll try to find the loins and give them a try. 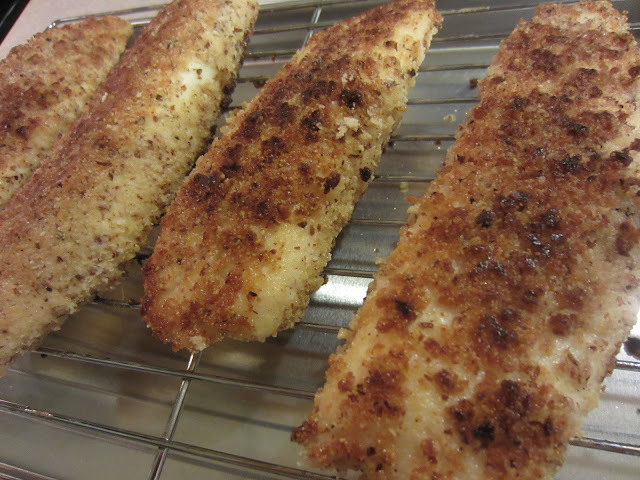 My hubby loves fish so he will be happy if I find one I like and make for him at home. I have tried the Potato-Crusted Flounder at Bob Evans and it was very good. Not fishy tasting at all. If you're at Bob Evans give it a try. Looks like its cooked PERFECTLY! I am not a fish girl. As much as I try to like it...I just don't! I can do some shellfish though- shrimp, crab, lobster! I don't have aversions to fish, but I just forget to buy it for some reason! Although, I did buy some frozen tilapia and we've eaten it twice this week. My fave way is just to sprinkle some Tony Chacheres over it and cook over medium in a skillet--done in 5 minutes! But I also tried wrapping the filets in prosciutto and that was pretty good too! I like the sound of this breading with the nuts_saving it! I don't like "fishy" fish either - never knew I could just buy the loin of tilapia - tilapia always had a weird aftertaste to me - must be the darker part! Thanks for the info and happy Friday! Oh yum! Your recipe looks so tasty! I'm like you--I don't make fish enough! I made a lot more when we lived in Delaware, but here in Chicago the prices are so high that I can barely bring myself to purchase it. I remember in DE we could find tilapia (fresh) on sale for as little as $3.99/lb, so imagine my shock when I realized that the sale price here is more like $8.99/lb. Yowza. I miss fish! Don't feel bad Renee, I live right on the Pacific Coast of Canada, and I don't eat enough fish either. What is silly too, is that meat shipped half way across the country is less expensive than local fish. I should go frozen more often, you've inspired me. Have a great weekend. Perfectly crunchy almond fish...love it! I use to be afraid of cooking fish but over the years I have discovered some awesome ways to cook it and I no longer fear it. Here in CA we have just about every kind of fish available that we could want. We are spoiled when it comes to variety at the market. I'm not complaining. After growing up in the Midwest I know for fortunate we are! Your recipe looks amazing! I like panko crumbs for a nice bit of crunch. I recently made some almond coated chicken tenders that we liked. The almonds add a nice change of flavors. I do like to purchase those Tilapia Tenderloins at Costco too - they are so meaty and don't fall apart. Your Tilapia looks so delicious. I am going to try your crust I really like the flavor combination in the recipe. Thank you so much for sharing with Full Plate Thursday. Hope you are having a great week end and come back soon! I don't eat fish as often as I should either. And really, I don't know why...because I love it! I think it's because I want it fresh and since I don't live near any coast, well... This sounds awesome, I would love to try it! thanks for stopping by Debbie! yes, this is one of my all time faves! This seasoning would also be good on halibut and sole. 1. When did the fish come in? 2. Has it been previous frozen? Fish is best if it is cooked either the day or day after it came in. And if it was previously frozen--it isn't fresh. Also, if you can smell the fish--it isn't fresh. I would never buy fish where there is a fish order surrounding the display.